How can it be Wednesday again already? But I guess there's no arguing with the calendar so it must be true. That also means that after today, there are only two more Wednesdays before Christmas! So I was able to get my decorations up over the weekend. This will probably (hopefully) be our last Christmas spent inside these walls. Wait, didn't I say those same words last year?? I don't mean that in a bad way of course...it's quite bittersweet, actually. So just in case this is our last year, I thought I might change my mantel one last time. well, let's just say that I copied her idea she inspired me! an extra wreath, and plenty of greenery. So down came the collection of clocks and books that had lived there for several years. After the first of the year I plan to minimize the décor anyway to prepare our home for the market. I also thought this would be the perfect time to practice for life in the country! I was actually kind of surprised that I really liked it! I do realize that dead animal skulls/antlers are not to everyone's liking...and that's okay! where our friend, Terri from Florida asks us the questions and we answer them. I have only visited Disney World one time when I was about 19 years old with a friend of mine. We were really in Orlando, Florida to visit her aunt but since we were right down the road, we spent a day there as well. It was in the process of refurbishing and Epcot was under construction if I remember correctly so it was not the best time for a visit. I have never really been in to Disney so it was just okay. I do remember though, as a little girl, looking through our View-Master and there was a disk with 3-D photos of Disneyland. I might even recollect a little oohing and ahhing going on. The first roller coaster I ever rode was at the Pavilion at Myrtle Beach, SC when I was about 13. I think I rode it about seven times in a row...after I hit my head in the bottom of the swimming pool when I dove in. Not a smart thing to do. If I ever rode another one, it was against my better judgment but soon realized that I do NOT like them much. Yes, I thoroughly enjoyed fairy tales as a child and I don't remember them scaring me much. My favorite was "Goldilocks and the Three Bears". I wanted to be able to jump into that cute little house in that storybook with all those cozy, soft chairs and beds. 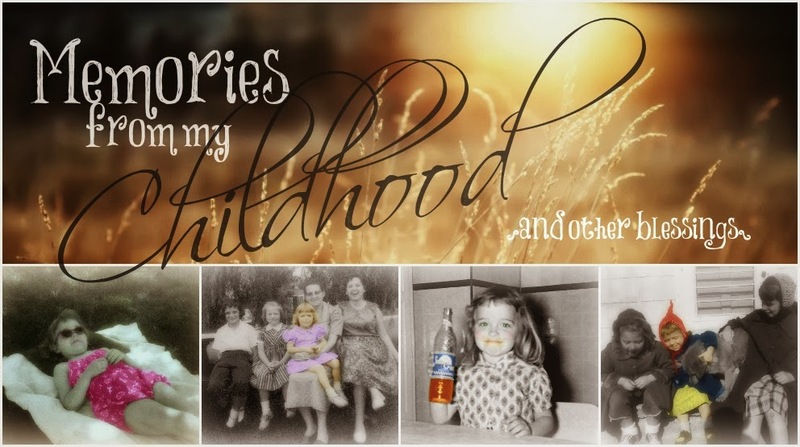 I actually wanted to BE Goldilocks! Since I had sons and grandsons until Olivia came along, I had a tendency to call them all "Buddy" a lot. Then we had a dog named Buddy and it got kind of confusing. Now, Adam has a dog named Buddy! When it comes to my Oscar and Tasha, I sometimes refer to Oscar as Bubby... not to be confused with Buddy...and I call Tasha Little Girl or Baby Girl. 5. I can’t let this day go by without respecting George H.W. Bush, as he lays in state in the Rotunda of our Capital today. He was our 41st President and only the second father to have a son follow him as President of the United States. President Bush loved his colorful socks. I bought Joe a pair of George H.W. Bush socks for Christmas one year. 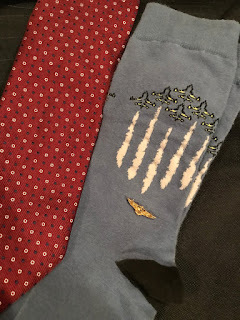 I know Myra has a pair… any other bloggers checking in today who have a pair of the Presidential socks in a drawer at home? How do you feel about colorful socks? These are the socks (and tie) President Bush will be buried in. I did enjoy the movie I mentioned in last week's post, "The Man Who Invented Christmas". It was interesting to know the back story of how Charles Dickens' "A Christmas Carol" came to be written. There was only one problem...I kept getting lost in Matthew Crawley's Dan Stevens' baby blues, losing my grip on what was happening in the movie. I about wore out that rewind button! And then there's my aching back, reminding me that this Christmas decorating business is not for sissies! I do so enjoy it once it's all decked out though. So what am I doing tonight? Helping to decorate at the church....such a glutton for punishment! Now where did I put that bottle of ibuprofen?? So that's what's going on here. What a fun read, Debby. I enjoyed your mantle and do hope that it is your last year there (if you want to move that is). I am not even decorating this year at home because we are in transition mode. Next year I will be in a a whole new place to decorate,hopefully. You are so very funny! Your Christmas decorations are unique and I love them. Great practice for a country Christmas. How I envy you on that. That's awful that you hit your head on the bottom of the pool. Is that why you rode the roller coaster 7 times in a row? 😂 we saw the Man Who Invented Christmas when it came out and I liked it. Maybe need to watch it again. (Did I say that last week?) and now that I have read your answers, it occurred to me that I call our grandsons Buddy all the time. I just never thought about it as a nickname, it's just something I do. A unique mantel for sure! I would probably skip the deer skull personally ... just not into skulls of any sort, though I know they are trendy. But it is an attractive mantel. Now that you mention it, I remember seeing Disneyland -- or maybe it was just the Frontierland part -- on Viewmaster. We loved those things as kids. So nice of you to help decorate your church! My parents pitch in at their church also. Since I am usually up there on weekends in the Spring, Summer and Fall, I don;t really have a church around my house! I should get to work on that! Have a great day! 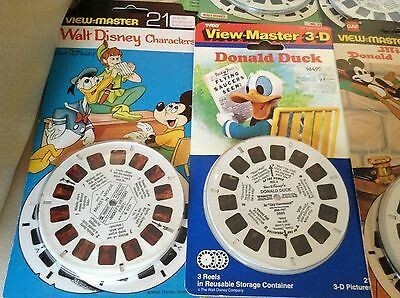 I had a view master and Disney reels too...I had forgotten about that! Love your mantle and lots of fresh greenery! Holiday hugs! Your answers were so much fun to read. I think you would make a perfect Goldilocks and in fact, that is how I will think of you from now on. 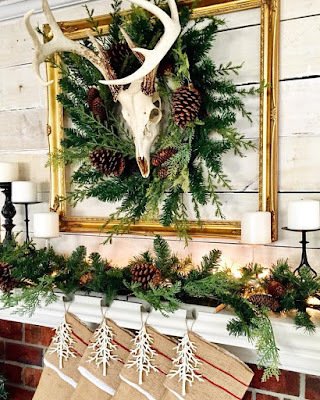 Again, you did an amazing job with the mantle and all of us need to think about adding a skull with antlers to our decor. If Sherry inspired you, Debby, then you have very good taste :) Gorgeous! And I can understand why you were distracted by those baby blues. You DO have very good taste. Well, I'm not into skulls at all but if I were I'd love to have yours decorated as you have it done for Cmas. So pretty! I loved Goldilocks as well. I'll have to watch that movie. Happy Wednesday! Your mantle looks so pretty, Debby!!! I'm glad that you liked the movie. I still need to find time to watch it. I guess I have too many Hallmark movies on my agenda. Enjoy those fun socks, my friend! I'm probably one of the few people who have NEVER been to either Disneyland or world. I love roller coasters. First one was at Palisades Park and it was an old wooden one. Goldilocks and the three bears! That one is very special to me and I really should have put it as my favorite. My dad used to tell me that story at bedtime and now today sometimes I feel like Goldilocks when I am shopping! ACK! I enjoyed your answers! Happy Wednesday! Your decorations look quite lovely.Maybe not my first choice, but they still look good in the right setting.I'm more of a flowers and pretties type of person. You have great style! I absolutely adore the former clock mantel. And you gave your blogging buddy a fine compliment. No, no presidential socks for me. 😉 Decorating down, shopping, wrapping, baking next! Where IS that Ibuprofen bottle? Thanks so much for joining in today! I loved learning about your nicknames and your colorful socks!! So far it seems to be about 50/50 on who loves roller coasters and who hates them! Your mantel looks FABULOUS!! I really love it! Your decorations looks so pretty and I do love you deer head mount. BUT I don't have one, in fact I need two and don't even have one. Rather expensive! What do you mean your last year? I always enjoy reading your answers which helps me get to know you better! Your decorations are beautiful! I'm with you about Dan Stevens' baby blues!!! Have a wonderful week. Your fireplace mantel is charming, Debby. I like the wreath with red berries and the greenery with lights. The lamps on each side add warmth and coziness. 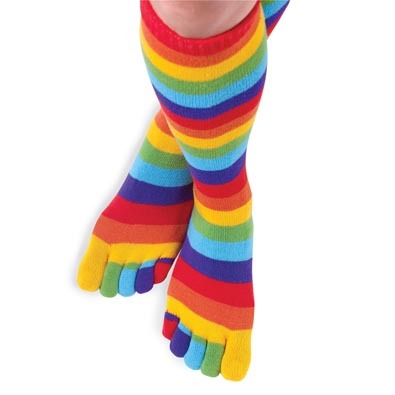 Oh my gosh, I remember those colorful toe socks, they were something else. That was nice of you to help decorate the church. Wishing you a peaceful and joyful Christmas season, Debby. I'm a huge fan of clocks! A bit I picked up from my Dad. So I really loved your mantel in the before photos. But change is also nice, and you did a very nice job!!! Oh, my word! I think I had those same socks!! LOL! Must be an Ohio thing, huh? So nice to visit with you, sweet friend. Your mantle is just beautiful!! Sending hugs your way today! Now that you mention it, I remember looking probably at that same view master reel & seeing the same picture you're talking about! Toe socks: Oh. My. You know they've come back? Crazy. I started watching the movie but about 10 minutes in started to fall asleep. I'll have to try during the day sometime and not when I'm in bed! HI Debby! Oh, how nice to hear from you and your mantel is stunning! I liked your clocks too but the way you did it this year is so lovely. I didn't realize you were moving. Seems like a lot of us are doing this? Are we all crazy at this age! I think so and I love it. The mantle looks very nice, I think you did a lovely job! Will you be staying in NC with your move? Enjoy the rest of your day! Hi Debby! 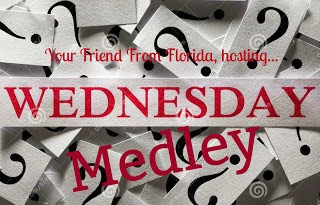 I didn't participate in Wednesday Medley this week but I enjoyed reading your answers. Ha! Time will tell if this is your last Christmas here. I like your version of decorations! Hope this week is merry and bright in your corner of the world. LOL. A beautiful mantle, Debby. That is a beautiful mantel. Thank you for stopping by today! Your sweet comments are such an encouragement to me. ...and she knows she is. RedWillow ...From Bud to Rose Fine Art. A room with a view...well, kinda. A tough nut to crack...apparently.